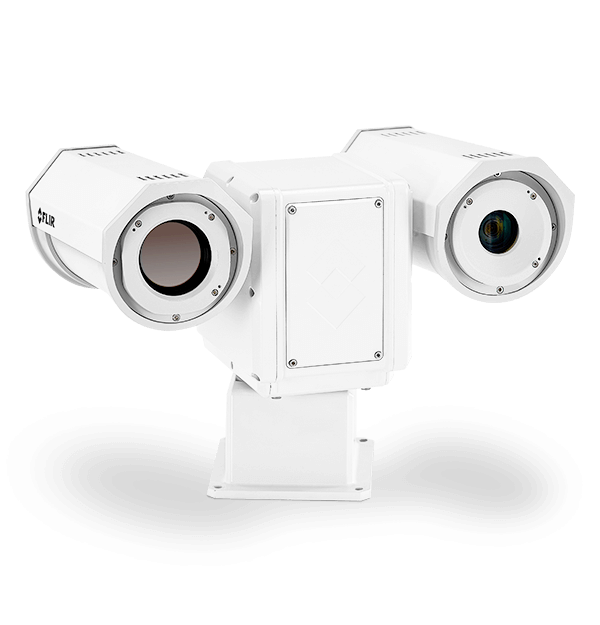 The Triton PT-Series HD's thermal camera offers up to a 14x continuous zoom, while the low light HD camera has a 30x optical zoom. The weather-resistant housing includes deicing and de-fogging capabilities, plus a changeable thermal payload cassette that significantly reduces maintenance time. When controlled using FLIR United VMS, enhanced capabilities are enabled, including automated PTZ tracking and fixed camera-target hand off. Not only can the FLIR PT-Series HD thermal cameras detect intrusions at great distances, they can also track intruders using built-in analytics. When multiple FLIR security cameras are deployed and controlled using FLIR’s United VMS, a target moving out of the field of view of a fixed camera can automatically be "handed-off" and tracked by FLIR pan tilt cameras.